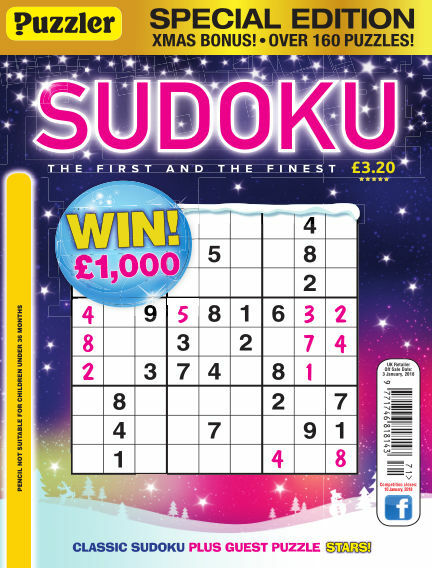 In this issue of Puzzler Sudoku : This is the UK's flagship Sudoku title, a full-colour, convenient A5-sized publication. Other puzzles featured are equally challenging brainteasers from Japan such as Bridges, Futoshiki, Killer Sudoku, Loop-The-Loop, Suguru and Tatami. We also showcase new and creative puzzles, such as Campixu and Round The Block. Designed to suit solvers of a range of abilities, the puzzles are graded into three levels of difficulty. Detailed step-by-step instructions, with diagrams, on how to begin solving a Sudoku are included for beginners. With Readly you can read Puzzler Sudoku (issue No.171) and thousands of other magazines on your tablet and smartphone. Get access to all with just one subscription. New releases and back issues – all included.